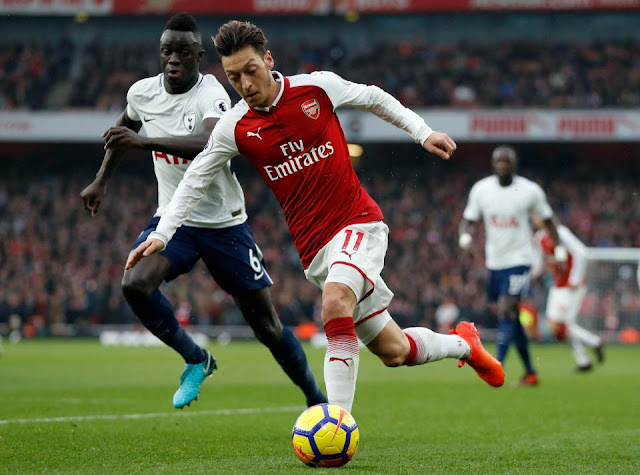 The matchday 12 ended with a big morale boosting victory for Arsenal at their own home, Emirates as Mesut Ozil stole the show and silenced his haters. Mauricio Pochettino's celebration for his 100th victory as Spurs boss was denied. This was his first loss in a Premier League north London derby as the shift of power has slowly swung away from Arsene Wenger's side. The goalscorers were Shkodran Mustafi, Alexis Sanchez. The first goal started with a long ball, which was brought under control brilliantly by Alexis Sanchez. 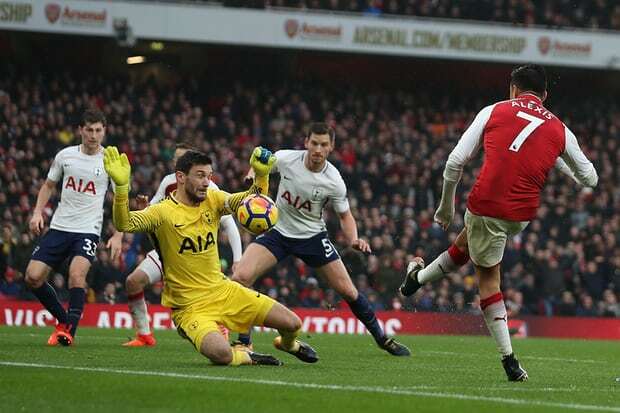 His namesake Sanchez dispossesed him with the help of a very good tackle, but referee Mike Dean ruled that foul by the young Tottenham defender in the favour of Arsenal. 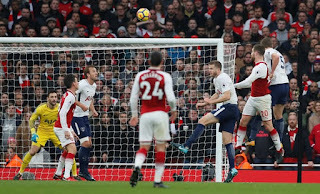 The ball from the resulting freekick was floated into the penalty area by Mesut Ozil, where the unmarked Mustafi leapt highest at the far post and steered a fine header across the face of goal and inside the upright. The bulid up for the second goal was started by Lacazette who got in behind down the right and played the low ball into the Tottenham penalty area, where Sanchez was waiting in acres of space. 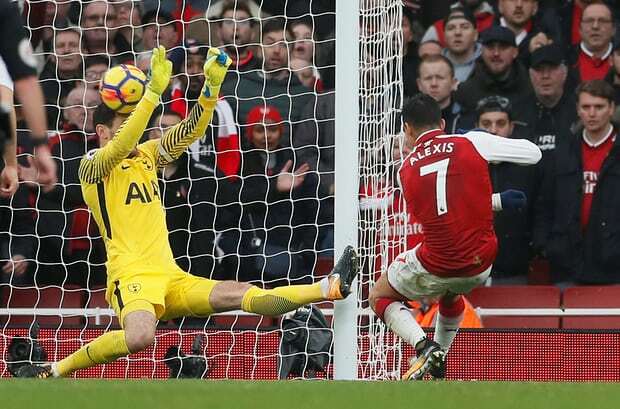 He made a mess of his first touch, but Lloris remained anchored to his line and allowed the Chilean to recover and rifle the ball between goalkeeper and near post from a ridiculously tight angle. The score was 2-0 in favour of Arsenal and they were in cruise control of the game which everyone expected them to lose. Arsenal richly deserved that lead needed at the break and had been clearly superior. Spurs will moan about the award of the freekick that led to goal one, and will argue that both goals were very, very close to being offside. But ultimately, Arsenal's big players Sanchez and Ozil turned up, and Tottenham's Eriksen, Alli, a not fully fit Kane had been short of their best. 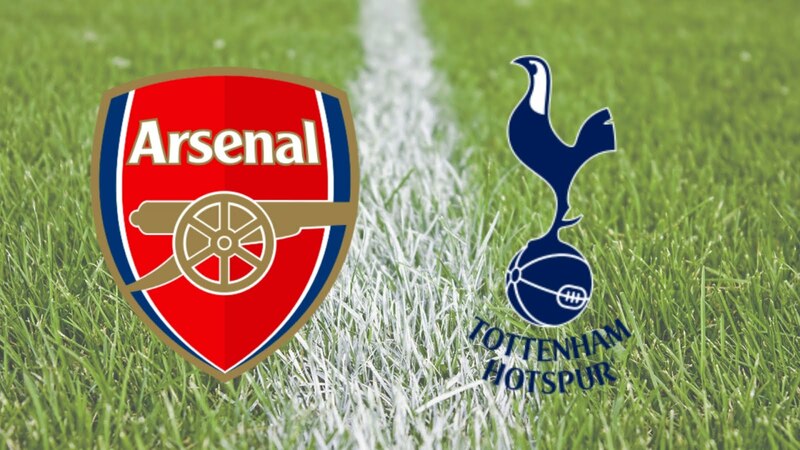 Tottenham's best chance came in the 56th minute which could have been the referee's moment who had the option to point to the spot after Kane went down dramatically following Kolasinac's challenge inside the box, but decided to wave the appeal away. Ramsey misjudged a ball played into his path, slipped, and allowed Eriksen to regain possession on the edge of the area. Eventually feeding Kane, the Tottenham striker had sight of goal, but the shot was expertly blocked by Mustafi. It could have been 3-0 but Lloris saved Tottenham as Ozil danced down the left , and crossed. Sanchez's first touch was poor, but he got it under control and hammered a shot at the near post. Lloris did better here, as he went off the line, narrowed the space and blocked the shot. All in all it was a good game for Ozil who inspired Arsenal to a much needed win but he should work this hard in every match, not just big ones against Spurs. He had been very impressive today, looked great creatively, while putting in his fair share of the grunt work when it came to tracking back and put various Spurs players under pressure.